This screen lets you create new Web Links and edit existing ones. 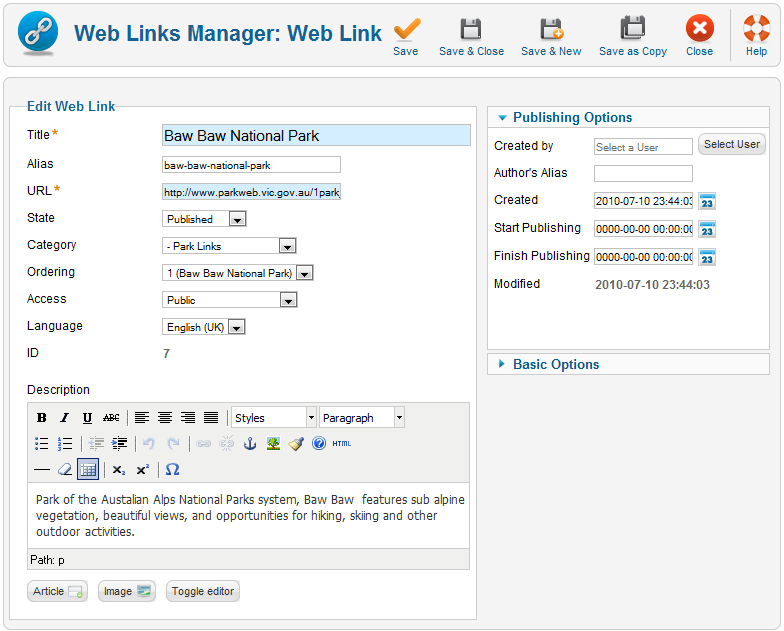 Navigate to the Web Links Manager. To add a new Web Link, click the "New" icon in the toolbar. To edit an existing Web Link, click the Web Link's Title, or check the Web Link's checkbox and press the "Edit" icon in the toolbar. This is where you add a new Web Link or edit an existing one. Note that you need to create at least one Web Links Category before you can create your first Web Link. This is where you enter or edit basic link information. Title. The Title of the Web Link. This field is required. URL. The URL of the Web Link. Reported: The item has been reported as invalid by a visitor. Category. Category for this Web Link. Select from the drop-down list box of Web Links Categories. Note that Web Links Categories are separate from other Categories, such as those for Articles, Contacts, Banners, and News Feeds. Ordering. Indicates the order of this Web Link in the Web Link Manager. The default Order is to add the item to the end of the list. To select a different position, use the drop-down list box. This item will be moved to the position just after the item selected from the drop-down list. Note that the Order in which the Web Links are displayed can also be changed in the Web Links Manager. Description. Enter an optional description to display below the Web Link. Author's Alias. Sets a different name than the author's for display. Use Global. Use the setting from the Web Links Manager Options. At least one Web Link Category must be added before any Web Links can be created.